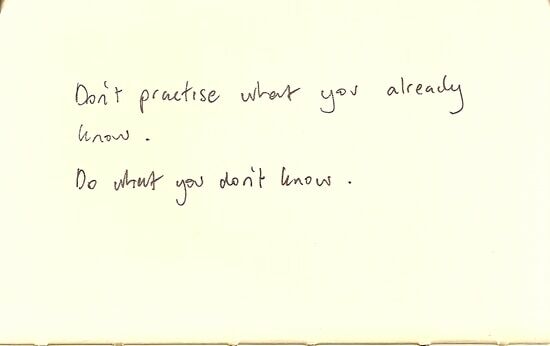 Don’t practise what you already know. Don’t practice what you already know. Do what you don’t know. What do you do when you first pick up the instrument? Play an E? A familiar lick? It’s that tendancy to go for the familiar, the stuff we like, that makes us work on the things we already know how to do. Maybe you do, maybe you don’t. It’s something I notice in myself. I naturally tend to go over things, always starting from square 1. I have to remind myself to start from square 34. And then tomorrow to start from square 82.